These are a few of the sincere questions a friend of mine recently asked me about our story project that led to a thirty minute conversation. She is genuinely interested in the process behind the final product and reads our stories religiously. In fact, I can count on her feedback within minutes after she loyally reads each entry. Orlando Giron with Francisco Mena (our interpreter), Caroline Sheaffer (the writer), & friend. Orlando comes in from a rural community to share his story. Thinking some of you might also be interested, here is a modified version of the process from our contacting an individual for an interview to the final product, the story appearing on the website. Thanks, Joan, for caring and for this idea. First, the process is exactly as the name implies: a process. It keeps evolving over time. The way my partner and I did things five years ago is not even close to how we are doing things now. We learn as we go and, we hope, improve, give it finesse, work off one another, and sharpen our listening skills, as well as polish our interview skills. For instance, I am doing less asking “wh” questions and more “tell me about” or “reflect on” ones. We are doing less guided questioning on one topic area and allowing a person to speak on areas he or she is most comfortable sharing. We are spending longer times with people to develop trust. I used to refer to notes constantly. I rarely use them any longer unless they provide background information about that specific person. My partner follows conversational cues. HOW DO YOU BEGIN TO CHOOSE A PERSON? Originally this was a faith story project, and since we were working with people within that structure, it was easy to find people to interview. We began with our scholarship students, pastors, and seminary students. Pastor Miguel, Caroline, Yaneth & Alexandria, Antonia (Miguel’s wife). 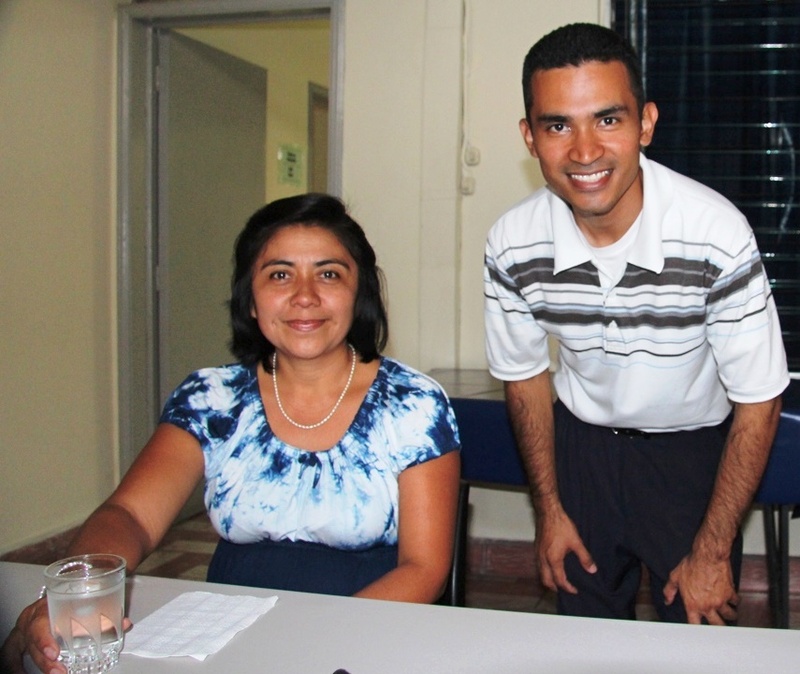 Pastor Miguel & Yaneth, a scholarship student were interviewed. It reached the point that all the stories were beginning to read and sound the same. We needed some variety to add to the mix for the sake of our readers. Plus we decided we wanted to expand to include others within the Salvadoran society and not limit ourselves to only faith-based issues. We also began to notice that some individuals were very uneasy discussing their faith. Many people have had very unpleasant experiences with organized religion, and when we asked “the faith” questions, they turned off and their stories ended. We once lost a powerful story because the faith issues so turned the person off that she withdrew her story. We always offer the opportunity to discuss faith but do not make it a major focus if the individual is uncomfortable discussing it. WHAT KIND OF PEOPLE DO YOU INTERVIEW? We wanted to represent the reality of El Salvador and show a tapestry of the country. We made a conscious decision to interview many different age groups which include children through elderly, many different occupations, and all socio-economic levels. We still struggle with whether to try to focus with one group or another. 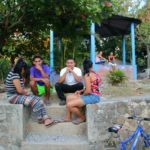 Sometimes we think perhaps of limiting ourselves to the folks in the campesino communities who are so hard-working and overlooked. But then we come back with the argument, if we do that, how will our readers come to know about some of the high profile individuals who are also valuable and contributing members within their society? We constantly assess and re-assess our strategies. WHO SETS UP YOUR INTERVIEWS? Interviews happen in a variety of ways. Before planning a trip, we may have a list of specific names we want to interview such as a specific artist or musician we know. We may also have a list of occupations or situations. For example, on the most recent trip I wanted to interview a survivor of a massacre, a Pipil Indian, a prisoner. We have a contact person who is willing to make the arrangements for us to set up the interviews. Generally we plan a visit of several weeks to allow for some flexibility for this coordinator to prepare a schedule for us. However, also during that timeframe we may have other work to manage such as checking on a Rotary project we are following, checking on our scholarship students, checking on our micro-loan recipients, checking on our seminarians, attending church meetings, and seeing friends we have made. These people are scattered all over the mountainous country; thus traveling to and from requires much time. We may try to see something different to write about that has been recommended to us as well. DO YOU EVER SET UP YOUR OWN INTERVIEWS? 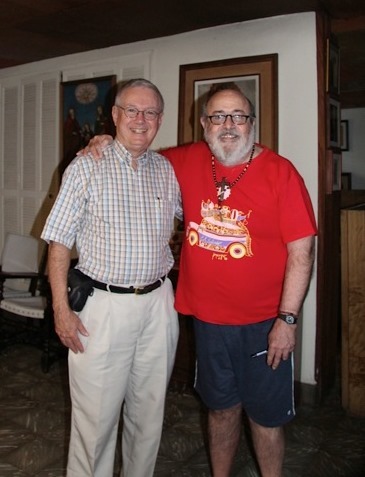 Pastor Don with Fernando Llort, a famous artist well known in Central America and much of the world. Yes, we do. As more and more people have become aware of our project, they are recommending names of people they feel should be interviewed. We then ask them if they can provide us with the person’s contact information to work out specifics to meet them. Once a person we asked to interview responded, “Sure, you can interview me, but you must also do my mom. Her story is much better.” Her mom was a Supreme Court magistrate, and what a story that turned out to be! Other times friends will set up interviews for us. Once in awhile if we run out of time and the person speaks English, we will ask if we can conduct a Skype interview with them after we return home. Some of the most interesting interviews are the spontaneous ones that just occur with no prior planning. This may be a person in the guest house in which we are staying or someone on the street. We have met some interesting students and Peace Corps workers this way. My partner arranges translators and drivers to get us to these storytellers who can be anywhere in the country. Yes, when you look at the map, it’s a tiny country, BUT it is up and down volcanoes and dirt roads. Finding someone available to get you from point A to point B at the time that fisherman Joe is ready to talk can be a real adventure. If the storyteller comes to us, we will offer to pay for his transportation costs. Often we will invite him to share a meal with us and cover that cost. If he is involved in a project of his own that needs support, we often give a donation to it. These are all out of pocket expenses on our part. DO YOU TAPE THE INTERVIEWS OR TAKE NOTES? Marisol (waiting to be interviewed) & Eduardo (assistant to Francisco Mena) provides much support. Both. We use a digital recorder, and I do my best to keep up during the interview by taking notes for back up in the event the recorder fails. If I know specifically whom we will be interviewing before the trip, I make every effort to research in advance the person in order to have some background information. Investing that preparation time, I feel, communicates a genuine interest in him or her. Plus not having to ask all the basic information such as spelling of name, birthday, etc. saves some time during the interview. The minimum amount of time for an interview for an English speaker will be two hours; allowing for translation during the interview for a Spanish speaker can be double that or longer. We’ve found that some interviews are better when we divide them into two segments over several days’ time so we are fresh to begin again. The fatigue factor serves no purpose for an interview. The break also allows the storyteller some time to think of some new things to add to his or her story. Rushing through an interview never produces an accurate account of a person’s life. Some people are very forthcoming and speak so freely that we barely need to insert a question because they are so prepared and their thoughts are so well organized. Others are more tentative, and we need to spend time developing trust with them before they really open up at all. My partner is good at lightening up the mood and helping a tense person relax. DO YOU WRITE FULL TRANSCRIPTS FROM THE TAPED INTERVIEWS? I write fairly complete transcripts after transferring the recordings onto my computer. I don’t bother with punctuation or paragraphs. It is all one long narrative, but all the information I need is there, and as I type it, I am comparing it word for word with the written notes I’ve taken during the interviews; these are sometimes not the easiest to read if we have been writing in the backseat of a truck on bumpy Salvadoran roads! IS YOUR STORY A VERBATIM OF YOUR CONVERSATION? Not exactly, but I do write it in first person to give it the illusion of that, and the information is all absolutely accurate. Often during the interview itself I will feel some rich nugget or kernel pop out that I want to be the focus of this person’s story. (I may jot that down in the margin.) If not, as I re-read my notes, I will delve into it, looking for something that jumps out to me that I want the story to revolve around. I also look for a quotation by the person that fits my theme and use it as a lead-in to the story. Yes, that is my introduction to the storyteller in which I get to pull the readers into the fascinating life they are about to read. Sometimes I also add a little at the end of the story as a concluding remark, but not always. If I feel the story is rich enough without it, I let it go. DOES THE STORYTELLER EDIT HIS STORY? Absolutely. We always ask during the interview if the storyteller wants to edit it and how we can contact him to send a rough draft. We explain it will be in English and it will be his responsibility to have it translated. Sometimes a very busy person will say, “I trust you and have no need to do so.” Others may not have computers to send it. But most do want to be involved in editing. The stories are also professionally edited in English, so, in essence, they are edited twice before going to print. The last things to be added are the photos which is one of my partner’s field of expertise. My partner felt we needed to add this section to our webpage to allow our Spanish readers to read their own stories. He was able to secure a volunteer staff of three professional Spanish professors/teachers who do this as time permits. We are ever so grateful for their service. There are two reasons for writing them. First, so many of our stories are extremely serious ones to read. We thought that having a story posted for two weeks was long enough to give readers a chance to review it. Then at mid-month we would provide a break from the somber mood and provide a different kind of read. The “Wanderings & Ponderings” are often essays on our travel experiences. Many are light-hearted and often make fun of ourselves, the gringos traveling south who make cultural snafus or run into some interesting diversions. Others relate to places we visited which totally surprised us, such as an unanticipated waterfall, a museum, or a place women were washing clothes in a community basin at the base of a stream. The second reason is our desire for our website/blog to have a different perspective or identity from other Salvadoran blogs. We hope it does just that. HOW DO YOU DECIDE WHICH STORY GETS PUBLISHED IN WHICH MONTH? Answers vary. Salvadorans celebrate certain significant events in Salvadoran history which we may have a story to coordinate with, such as a massacre victim to commemorate in May for the Sumpul River Massacre, for example. Because on the 15th of the month we include an essay or travel experience, we often TRY to coordinate that essay with a specific storyteller. For example, I wrote an essay on “Survivor’s Guilt” to go with the one of the Sumpul River survivors. I wrote one called “Focus on Art” to coordinate with the famous artist, Fernando Llort. They don’t always coordinate in a way like that, but sometimes they do. HOW DO YOU GET ALL THE PIECES NEEDED FOR THE WEBSITE TO YOUR TECH PEOPLE? I make up monthly templates which include all the information needed: both stories for the month, all photos, the wording for the 2 Mailchimps that will go out, wording and photos for the section at the bottom called “Upcoming Story.” My partner and I work in tandem, especially for the photos which he keeps in his computer library. In the past I’ve worked six months ahead allowing the tech people to post behind the scenes on the webpage at their leisure. That seems to bite me, however, when certain newsworthy events in El Salvador cry for a different story than the one I had planned six months ago. Without going into all the technical stuff, changing it is never easy. I am slowly learning to create a template no more than two months in advance now. WHAT HAVE BEEN SOME OF THE MOST DIFFICULT PARTS/ HIGHLIGHTS OF THE STORY PROCESS? It is a time-consuming process. We work long hours and we tend to get frustrated when others don’t dedicate the same time and work ethic into this that we do and fail to return their editing or respond to me as quickly as I think they should. Others have taken their editing very seriously and devoted themselves to accuracy and ended up with a nice final product. Some edits have taken months to do as they go back and forth numerous times. With most it is just one time. Sometimes we get our hopes up for a person who sounds like a strong candidate, but then for various reasons the interview falls through at the last minute. Sometimes the candidate we’ve traveled thousands of miles to interview is double booked and we get only a limited time with the person. It is now or never and we have to cut our questions in half. We’re learning to have fewer expectations and go with the flow. I become wrapped up in the stories of the people and tend to want to do everything I can to protect them; I try to anticipate anything that may be a problem for them. For example, I wasn’t sure if we should put the story of the former gang member online. I mean I agonized about that decision for weeks. I had many sleepless nights about that. This guy has a wife and three young children whom I did not want to put in harm’s way if the gang found him on OUR website. He assured me he was fine with the decision and wanted to share his story. Another tough one was a prisoner, a teenaged girl who had no e-mail address and who gave us her lawyer’s contact information to approve her story. I received no response after sending it twice. I felt very uncomfortable publishing her story without approval, but I remembered another contact we know in that office, and we wrote her sending the story the third time. FINALLY we got approval. I am not a techy person so I value and appreciate my team of people who support me in that area. NONE of us gets paid for what we do. Each of us pays our own way on the trips. It is a total volunteer endeavor. Coordinating all the details that need to be made for our trips is something I don’t have to deal with, and I appreciate those who handle that aspect. I get to show up armed with my dozen pens, recorder with extra batteries and loads of legal pads, and get to meet great people, talk, smile, and write. I’ve got a great gig going. I am truly blessed! WHAT GOAL HAVE YOU HAD IN MIND, AND DO YOU FEEL YOU ARE MEETING IT? 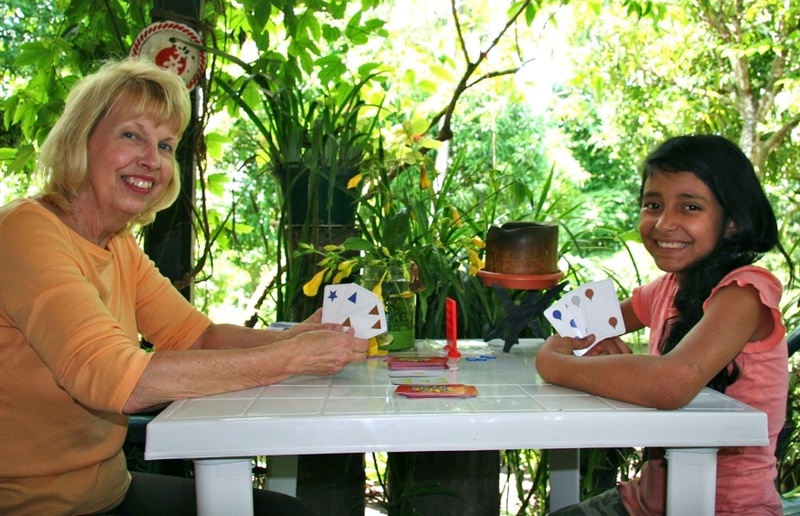 Originally we wanted to raise awareness in North Americans of the reality in which Salvadorans live. Most will never ever travel there to see and hear their stories. We also included those persons who work tirelessly on behalf of Salvadorans and either live there as expats, commute back and forth regularly, or advocate strongly for them. First we printed a group of 19 stories into a booklet to sell. The second group of 29 stories is in our second booklet. Our circulation was limited to the people we know. It was at this point that my partner suggested we go to the website to make them accessible to a wider audience. Like it or not, that is how the younger generation reads. There are always the unexpected benefits that make our day. Several people we interviewed have now died; their passings have further solidified our mission to continue this legacy. We received a note from Alicia’s grandson thanking us for the story and asking for more photos of his grandmother. He never knew many of the things we wrote about her. Experiencing the horrors of war is not something comfortable to talk about, and now that she has passed on and he is aware of them, he can be even prouder of his heritage. As our readership continues to grow, we are tossing around other ideas, but nothing firm yet. We are always in a state of flux and encourage reader feedback. HOW HAS THE PROJECT IMPACTED YOU AT A PERSONAL LEVEL? Before the interview, building trust. When you sit across the table from a person who is wiping tears and clinging to a tattered, yellowed newspaper clipping of a missing family member, albums of gruesome photos of dismembered bodies, and hear that person share things that perhaps he or she has never shared before, you are pulled into that life forever. We have heard many intimate details that we cannot print in our stories but we know in our hearts. We always make it clear to the storyteller that he or she has the final say what gets printed. It is THEIR story; not ours. Sometimes it hurts to see some rich information cut out, but again, it is their decision to do so. When a storyteller pulls you aside holding onto your arm and says, “I never realized this about myself until I shared this with you,” you realize how helpful this project can be personally to the storyteller. We form long-term relationships with many of these people. On our return visits we may not see each and every person we had interviewed, but we try to check on as many as we can through others who have put us in touch with them. 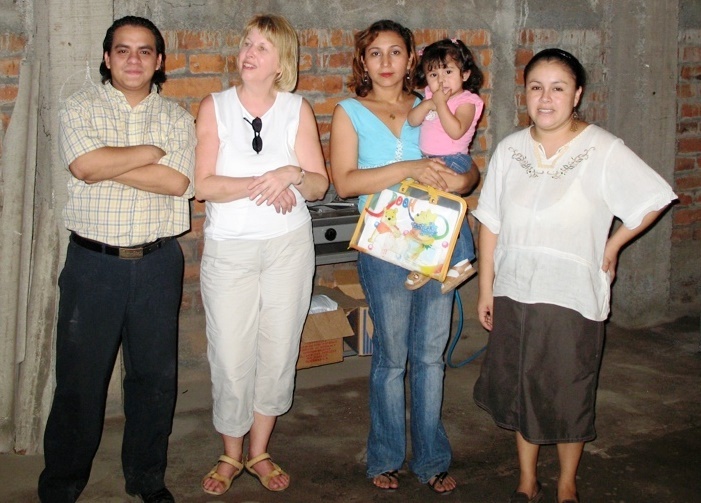 There is always the desire to return to El Salvador to support them and their families. Being able to encourage young people to keep studying to make a difference in their lives, seeing over the course of several years young seminarians who will make excellent pastors to their people, watching a little girl who was lying on her deathbed now running around healthy are just a few of the experiences we continue to hold dear as we maintain relationships with these people. This is what being in solidarity with others is all about to me.